Two separate chain collisions occurred along Tampines Expressway towards Seletar Expressway (SLE) at around the same time on Tuesday morning (Oct 23). Stomper Anonymous drove by the scene, before the Jalan Kayu exit, at around 8.20am. He contributed dashcam footage showing both his front and rear view. The first incident involved three cars and left two women with minor injuries. The collision is believed to have occurred after the first car allegedly braked suddenly. Responding to queries by Stomp, the police said they were alerted to the three-car accident at 8.37am while the Singapore Civil Defence Force (SCDF) said it was alerted at 8.38am. A 50-year-old car driver and a 35-year-old car passenger were conscious when taken to Sengkang General Hospital. Stomp understands that the driver suffered back pains while the passenger had a cut on her leg. Separately, the second incident involved five cars. Stomp understands that no injuries were reported in this case. Photos circulating on social media, which several Stompers sent to Stomp, show a silver car with its rear mounted on a black car behind. Stomper Z said: "This really happened this morning? 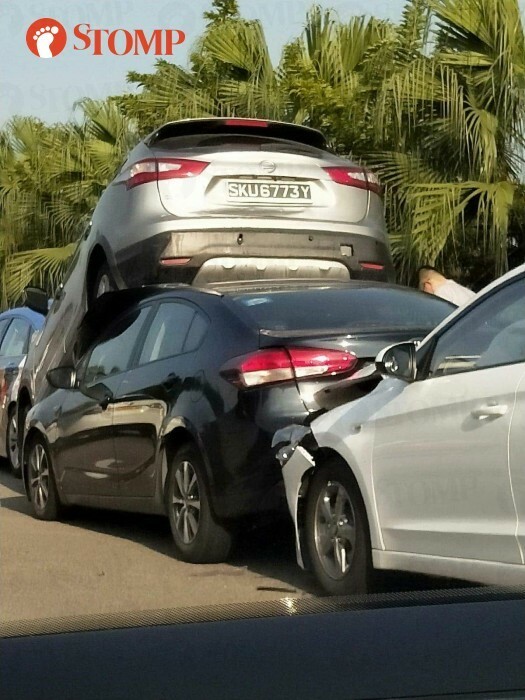 "How did that car got on top of the other car?"